The Chair of the IHRA Committee on the Genocide of the Roma, Martina Maschke, and Committee members Gerhard Baumgartner and Dušan Sla?ka, attend the 2 August commemorations at the Auschwitz-Birkenau State Museum to mark the day of remembrance for the victims of the genocide of the Sinti and Roma, on behalf of the International Holocaust Remembrance Alliance. 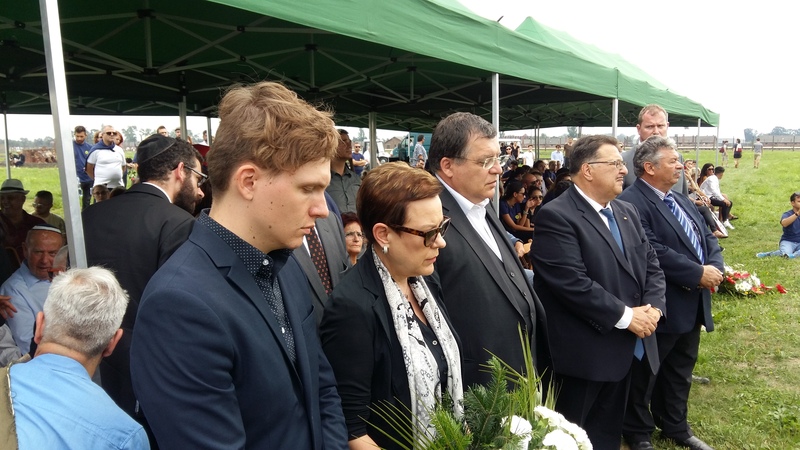 The commemoration at the Auschwitz-Birkenau State Museum marks the day in 1944 when the last group of nearly 2,900 Sinti and Roma were killed in the gas chambers. "For too long there was silence about the persecution of the Roma under the Nazi regime. For too long the survivors were not heard. Today we stand together to break this silence and to give a voice to the victims and the survivors." We should never understand remembrance and commemoration as empty rituals, but rather as a contribution to upholding those democratic values which form the foundations of European civil society. Identity needs remembrance. And people who have a strong identity are able to face challenges in the present with greater self-confidence." On 1 August, the Committee members visited the oldest Roma museum in Europe which is situated in the Ethnographic Museum of Tarnow. The museum was founded by Adam Bartosz in 1979. Bartosz, who was director of the museum until 2012, gave a guided tour of the museum followed by a tour through the remnants of Jewish Tarnow. Bartosz, who is also chairman of the Committee for the Protection of Jewish Heritage in Galicia, also took the Committee members to visit the memorial of Zbylitowska Gora where in 1942 around 6000 Jews, including 800 children, were murdered, the Borzecin memorials and the memorial in Szurowa which was the first memorial to be erected for the Roma victims in 1965. The IHRA Committee aims to raise awareness about the genocide of the Roma under National Socialism and against this background seeks to increase the commitment of the IHRA to inform, educate, research about and remember the genocide of the Roma. The Committee also seeks to draw attention to the continuous prejudice towards Roma before, during and after the Second World War as well as to demonstrate the link between the history of discrimination and persecution and the present situation of the Roma. In 2015, IHRA's Committee developed a unique bibliography and historiographical review as well as an an overview of international organizations working on historical and contemporary issuesconnected to Roma and Sinti. On 2 August 2016 the IHRA Chair issued a joint statement together with Michael Georg Link, Director of the OSCE Office for Democratic Institutions and Human Rights, underlining that greater efforts are needed to protect endangered memorial sites and ensure the dignity of victims. The International Holocaust Remembrance Alliance unites governments and experts to strengthen, advance and promote Holocaust education, remembrance and research worldwide and to uphold the commitments of the 2000 Stockholm Declaration.